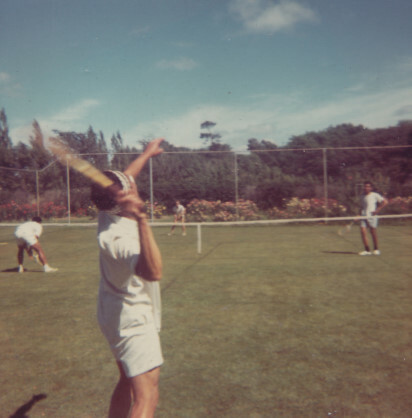 Tennis was a popular summer sport, as was cut-throat croquet. Note rose gardens at back. I hope that Francie is now completely recovered from her short illness. I’m sorry I did not write to everyone to thanks them for their Birthday and Christmas presents. I was going to, but before I knew it we were at “Highden”, so that put an end to that. Thank Mehegan & Tony especially for the biro & refill which is in constant use, and also Helen & Rick for the underpants (which are also in constant use!) I had actually written to Sue & Kitch, but they visited me so I did not post the letter. For most of this last week we have been haymaking, i.e. picking up the bales. It was a good break from classes which we now have been doing for three weeks. It was also quite good fun. Fr. Larkin from Silverstream called in & I got a running account of how good Leo was. He recognized me as Leo’s brother. Fr. Hill from St, Pat’s Town is staying here at the moment, He used to be T Silverstream when Tony was there, right up to my 5th form. He said that he saw Mehegan & Tony in Wellington shopping for a wedding present for David Hansen. Fr. Bennett took us for a swim last week to Paorangi – St. Paul’s, Feilding. They have tremendous baths there. Today Bernard Cuttance & John Kavanagh visited us for several hours. I don’t know how they managed to get permission off Fr. Bennett but it does not happen very often. We seem to be laughing all the time here – it is quite ridiculous because you roar your head off at the most trivial thing. However Fr. O’Connor says that Novices haven’t changed one bit over the last 40 years, & says that it is just tension. The 12 of us have been here for only 3 weeks so I don’t know what the tension & laughing will be like in another 49 weeks. We must be due for a Conge soon. Here we are never told until breakfast time of the actual Conge day but we expect one any day. Apparently there are no local rivers or swimming holes, so it’s a matter of picnicking out in the middle of some paddock. P.S. While Fr. Bennett’s away we have to write “The Story of My Life & Vocation” so that ought to be interesting. He reads it & then destroys it.